Europe, it’s safe to say, was focused on a lot of threats in the last month — a polarized British electorate that voted to leave the European Union, ongoing worries about the Italian banking sector, yet another terrorist attack in France, a failed military coup in Turkey. No one has spent much time considering the possibility that political instability could come to the Netherlands, a northern European country that was one of the six founding members of what is today the European Union. 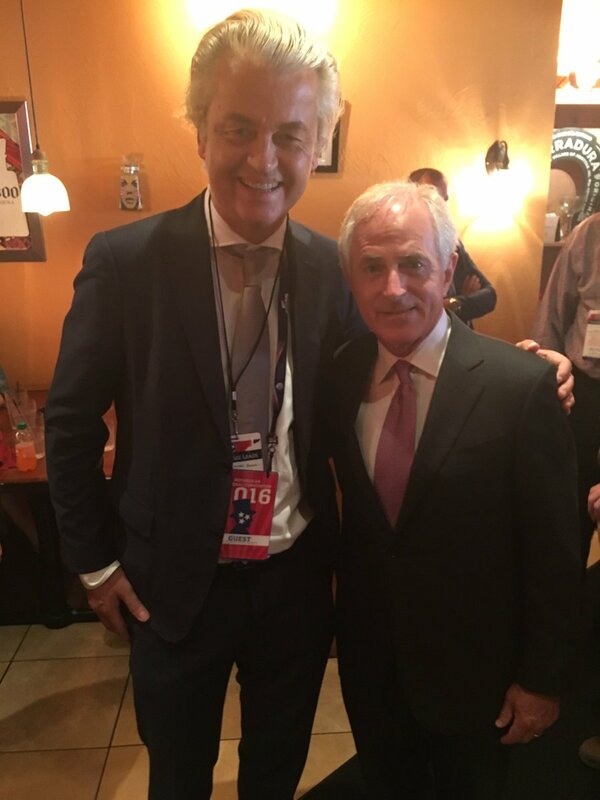 As Americans and non-Americans alike turn to Cleveland to watch the unorthodox spectacle of Donald Trump’s formal coronation as the Republican Party’s presidential nominee, one of the Europeans in attendance hopes to become the next prime minister of The Netherlands. And he has reason for optimism. According to polls, Geert Wilders’s Partij voor de Vrijheid (PVV, Party for Freedom) could win the next Dutch election, which must take place before March 15. If those polls hold, Wilders, who has been a fixture in Dutch politics for more than a decade, would win the election by a robust margin, dwarfing the more traditional center-right, liberal Volkspartij voor Vrijheid en Democratie (VVD, People’s Party for Freedom and Democracy) of prime minister Mark Rutte. Wilders has enthusiastically embraced Trump at a time when nationalist populism is on the rise throughout the United States as well as Europe, tweeting out ‘Make The Netherlands Great Again’ to supporters earlier this spring. He’s arrived with a splash at the Republican National Convention, invited by the Tennessee delegation. As an outspoken critic of immigration, Islam and the European Union, Wilders hopes that he can finally break through to an election victory in March and perhaps, at long last, fulfill his dream of becoming prime minister. Wilders inherited much of the support that Pim Fortuyn once commanded before the latter’s assassination in 2002. 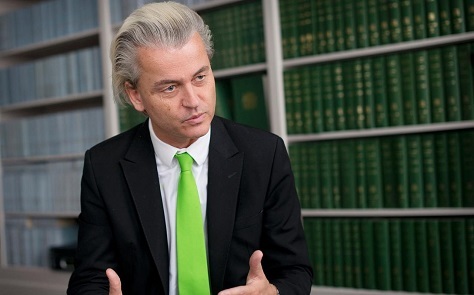 Wilders is known mostly for his outright rejection of Islam and his quest to terminate all immigration from Muslim-majority countries into the Netherlands. Though Wilders often denies links to other European far-right parties by pointing to his more liberal record on economic policy, he is clearly the Dutch analog to figures like Britain’s Nigel Farage and France’s Marine Le Pen. Wilders is currently on trial in the Netherlands for inciting hatred as a result of disparaging comments he made about the Dutch Moroccan minority, though he wears the legal dispute as a badge of honor — a politician willing to speak the truth about Muslims. For more than a decade, following the assassinations of Fortuyn and filmmaker Theo Van Gogh (the latter killed by a Dutch citizen of Moroccan descent in 2004), Wilders lives under strict protection from potential threats. Willem-Alexander became the king of the Netherlands today, succeeding his mother, Beatrix, who abdicated the throne, having served as the monarch of the Netherlands since 1980. 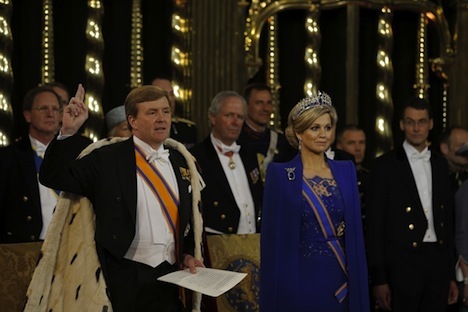 The Dutch head of state, notably, is a highly ceremonial role. What’s key to remember is that following the 2010 election, the Dutch monarch is no longer the key player in appointing an informateur following parliamentary elections to kick off coalition talks, given the prevalence of a half-dozen or more parties in the Netherlands. The 2013 coalition formation process was determined solely through the Dutch parliament, bypassing royal input altogether, and the process actually took even less time. So Willem-Alexander will be assuming the throne with the least amount of institutional power over Dutch government than any of his successors. It’s not even a coronation as such because the Netherlands no longer has a state church, so there’s no one to administer a coronation, apparently. Much more here from The Guardian. More here from NRC if you speak Dutch (or are otherwise curious). He’s pictured above with his wife, Queen Maxima — their daughter, Catharina-Amalia, at age nine, becomes princess of Orange and heir to the throne, so expect a return to the long line of female Dutch monarchs. Beatrix succeeded her own mother, Juliana, who reigned from 1948 until her own abdication in 1980. Beatrix’s grandmother, Wilhelmina, served as queen from 1890 until abdicating in favor of Juliana in 1948. This marks the third consecutive abdication of a Dutch monarch — it’s a marked contrast to the British model, where Elizabeth II continues a reign that began in 1952.